Davidson's Plumbing, Heating & Air Conditioning is there to fix those problems, making sure your day-to-day routines, whether at work or home, continue unabated. 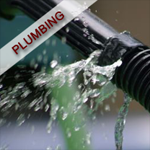 A plumbing system vent does just that: it "vents" the plumbing system in your home. A vent will look like pipes sticking out of your roof and are about 12" high. This vent allows sewer gases to be vented outside the home. Another function of the vent is that when a liquid goes down a pipe air must follow it. Without vents, draining one fixture may cause another fixture in the house to back up. A waste and vent system should keep sewer gas out of the home and drain every fixture well. The rattle you hear is usually caused by the water lines not being properly secured. This can be fixed easily but only if your water lines are easily accessible. It means that there are one or more places your water lines come in contact with the wood of your floor joists. You will need to get plastic pipe hangers that go between your water lines and your joists. A defective pressure reducing valve can also cause some very strange noises. Contact a plumber for help. Why does my toilet "sweat" and what can I do? Do not confuse toxic drain cleaners with the various drain maintenance products that are on the market. These products contain "friendly" bacteria and enzymes. They work great to keep any drain sludge and grease from building up in the pipes.